Trade data came in better than expectations, and is further evidence that growth momentum picked up into the end of 2015. A weaker yuan might have helped contribute to the better numbers after declining around 4% vs. both the USD and JPY. But, the yuan is still almost 8% higher against the EUR, China’s largest trading partner currency, so a weaker yuan has probably only contributed a modest improvement to the trade data. China's share of total global exports is still rising, and the trade surplus continues to hit new record highs. Those two factors leave little reason for an engineered fx devaluation from Beijing meant to make exports more competitive. Exports are already competitive, and growth stimulus needs to come from domestic tools. All in all, the data supports my view that it is very probable Q4 headline GDP numbers will be better than current expectations when announced next week. Trade for processing and exports was much weaker than trade for domestic use. Exports for processing declined 10% from last year. That points to weak global trade in general. 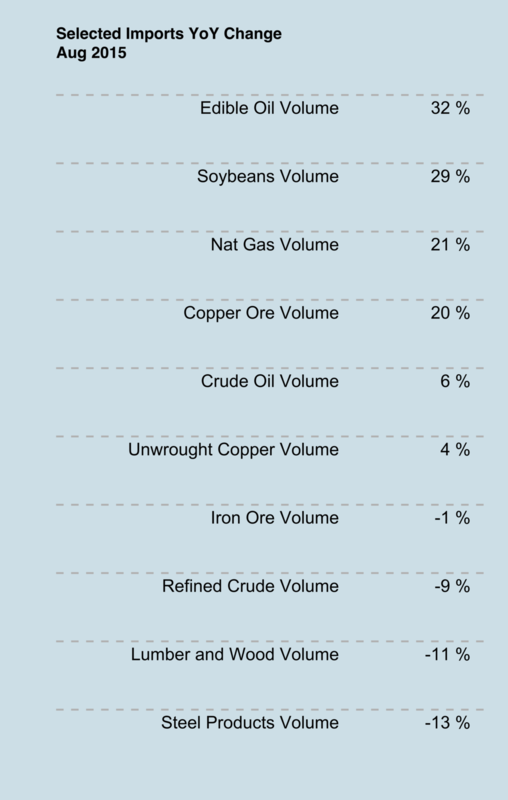 Key commodity imports by volume increased from last year. On the year, crude oil imports rose 9%, with copper and iron ore -0.3% and 2% due to declines early in the year. Commodity demand has increased going into 2016. If we adjust imports for commodity prices moves, we get an adjusted import number of around 2%, weak but positive. Exports to EM economies declined overall, indicating weak demand from those economies, as well as weak growth in the global supply chain. 2015 was a tumultuous year for China sentiment and markets. A massive stock market roller coaster ride, the most currency volatility in decades, turmoil caused by Beijing's poorly articulated policy moves, and widespread disbelief of official economic numbers led to a low-point in sentiment in the last two decades. Google searches for the words "Chinese Economy" this year much more often than last year were accompanied by the words "collapse" and "crisis." But, under the hood this was a big year for reforms and restructuring. We saw significant progress in rebalancing from a super-charged industrial policy towards an economy increasingly driven by services and household consumption; all the while employment stability was maintained. The economy saw the slowest debt accumulation in twenty years. The last of China's benchmark interest rates - the bank deposit rate - was finally freed up. The yuan moved more towards market-driven price moves than any time in the last few decades. Local government debt and shadow banking risks were reduced significantly. 2015 may be the first year in many that housing sales outstrip completed homes. Residential inventory has actually declined. But not all was good. Zombie firms were kept on enough life support by Beijing only to end up flooding the rest of the world with cheap materials, like steel and aluminum. Bankruptcies and failed firms are still a rarity, even as a number of industries - mining and smelting in particular - see financial losses mount. No progress was made on fixing industrial overcapacity and corporate debt load. Pollution levels hit new highs in some major cities. Xi stepped up the Party's power consolidation, rounding up more lawyers and journalists, along with business tycoons and powerful Party members. Market freedoms are increasing, civil freedoms have been reduced. Here is a list of what I view as the seven most important issues that took place this year. 1) 2015 was a momentous year for the yuan. Beijing broke from its previous currency regime, allowing markets more influence in currency moves and modestly devaluing the currency in August. Poor communication of intentions led to turmoil in global markets worried over a new currency war or China's potential to export deflation if Beijing devalued further. The IMF decided to include the yuan in its Special Drawing Rights (SDR). The SDR's yuan addition will take place in October of 2016. This is the first change in the SDR currency makeup since 1999, and the first time an EM country was added to the basket. The yuan weight will be nearly 11%, compared to roughly 8% for the JPY and GBP each. The USD and EUR will be roughly 42% and 31% respectively. Beijing's end goal is not to become a small slice of the $280 billion SDRs. The end goal is to become a large slice of the $11 trillion reserve asset market for both political and economic reasons. The IMF's stamp of approval will facilitate inflows from central bank reserves, sovereign wealth funds, and other institutional money managers. Beijing this year made a promise to make the yuan fully convertible by 2020. Such a move would have significant implications for global asset markets. China has the second largest stock market and third largest local currency bond market in the world. By 2020, many emerging market investment indices will be dominated by Chinese stocks and bonds. And, Chinese mainland savings deposits total $21 trillion. Outbound investment by Chinese mainland investors will have a huge impact on global markets and global asset management firms. 2) China's two-speed economy diverged considerably in 2015. In 2015, China saw its economy running at two speeds. Underdeveloped services and consumption grew at a relatively fast clip while industry and construction - China's traditional drivers of rapid growth - have slowed to new lows for those sectors. Don't count on Chinese consumers to replace the hole in global demand left by declining demand from China's once rapidly growing industrial and construction sectors. China's industry and construction sectors drive demand for commodities and industrial machinery - the economy's primary imports. For many global suppliers to China's once insatiable industrial juggernaut, 2015 felt like a hard landing year. 3) 2015 saw widespread skepticism over China's official GDP numbers. Doubt over the veracity of China's official economic numbers has been around for some time, but 2015 seemed to be a peak year for skepticism. There are two reasons for this in my view: 1) The two-speed economy has caused many to mistakenly conclude broad growth is in hard landing territory. As consumption and services drive growth, conventional measures like electricity and rail freight are increasingly less relevant as a total GDP measure. Using traditional measures of heavy industry production and traditional bank lending will result in an indication of narrow sectors, and not broad growth. The service sector, over 20% larger than the industrial sector, has been largely ignored by many analysts and pundits. 2) Much of the skepticism of official data comes from some of the most pessimistic forecasters. Skepticism of official numbers combined with custom indicators that use industrial-only indicators only allow the most pessimistic forecasters to say that their forecasts have been right on the money. The balance of statistical evidence from research done by the San Francisco Fed, my own research, and domestic evidence - like employment stability - points to official numbers in the ballpark of underlying broad GDP growth. Below are links to blog entries with more details on the subject. 4) New revelations about China's deadly pollution came to light. Some major cities in China have been recently besieged by thick clouds of air pollution. China has set massive outlays for green energy investment, but there are two studies out this year that remind us how bad things are. This year a study by Berkeley Earth monitoring 1,500 measurement stations over four months concluded that 17% of Chinese deaths each year can be attributed to air pollution. That is 1.6 million citizens a year. That is 180 deaths each hour from air pollution alone. That number was more than double the estimated 650,000 deaths attributed to air pollution by the WHO in 2007. Berkeley Earth researchers estimate nearly 40 percent of Chinese residents were regularly exposed to air that was unhealthy to breathe. And, the effect of Beijing's air quality is the equivalent of smoking 40 cigarettes a day. Also this year, NASA's GRACE satellite data showed that the majority of the world's largest groundwater basins - major sources of the planet's drinking water - were being rapidly depleted and on the verge of disappearing. The North China Plains aquifer, which provides water for 11% of China's population and 14% of its arable land, was one of the critical basins cited. The NASA revelations are a reminder that China has serious problems with its water resources. 5) The housing market rebounded, mostly in the wealthier and tier 1 & 2 cities, but construction remains in the dumps. China's residential housing market rebounded in 2015, with prices and sales rising higher after Beijing introduced policies to support the market - including lowering the required mortgage down payment. But, higher prices and improved sales have yet to convince developers to increase construction activity. Construction has yet to rebound, keeping the impact on overall growth subdued. Investment in residential real estate is still declining. Most of the rebound has taken place in the top-tier, wealthier cities, especially on the coast. The hinterlands (where most overcapacity and ghost cities have been built) are still negative. A housing rebound in the larger more economically vibrant provinces will add to broad growth prospects. New housing inventory has contracted this year - more than any time in the last few decades. I calculate that this amounts to about 1.5 million fewer housing units on tap to be finished this year compared with last year. After a surge in sales, at the current pace demand is probably outstripping supply this year. 6) China's debt burden is still growing, but much was done in 2015 to mitigate some key risks. China's debt burden grew in 2015, as broad debt expansion outpaced economic growth. But, transparency into opaque areas of China's debt burden has been improved significantly through Beijing's local debt swap and the declining use of shadow banking. Two favorite topics of China hard-landing doomsayers - opaque local government debt schemes and the rapid growth of murky shadow banking - are successfully being diffused. Local government debt swaps - intended for "closing the back door, and opening the front door" for local government lenders - allow local leaders to swap ousdtandig debt in the form of opaque financing vehicles for more transparent municipal bonds. The creation of a municipal bond market will make debt more transparent and allow financial risks to be diversified away from banks. Launched in March this year, the swap program plans to swap out roughly 15 trillion in murky local debt with municipal bonds over then next three years. Trust loans, entrusted loans, and other shadow banking vehicles that over the years have worried analysts and economists slowed in 2015, as more transparent credit growth - non-financial bond issuance for example - thrived. 7) 2015 highlighted the risks and limitations of Beijing's control over market forces. Within economic transitions, liberalizing markets is messy business. If it were not, then every developing market would already be like Hong Kong. China's stock market rose spectacularly, and crashed in a dramatic and short-lived one-year roller coaster ride. Chinese leaders willfully failed to stop the bubble from inflating and struggled to fix it when the crash came. China is still in transition, and we should expect to see more difficulty in managing market turmoil in the future. Never before have China’s economic reforms been so precariously balanced between maintaining robust growth in order to maintain social stability, and reining in the excesses and imbalances from the supercharged decades-old industrial policy. Policymakers are attempting to fulfill two often diverging goals of adding stimulus with one hand and trying to force rebalancing and discipline with the other hand. Those opposing goals will continue to add policy risk and drive the two-speed economy to diverge further in 2016. We should see growth stabilized but slowing, with larger divergences between new growth sectors and traditional growth sectors within the economy. Financial system risks, overcapacity, malinvestment, and the turmoil of market liberalization will not disappear, but we should see more headway on mitigating those risks in 2016. Growth has finally begun to pick up as the year winds down, a result of more than a year of piecemeal monetary easing, pro-housing market policies, consumption-boosting measures, and fiscal stimulus. Going into 2016, the momentum should keep the economy stable for months to come. More easing and fiscal measures should be expected, but less than in 2015 as Beijing moves the growth target one notch lower. China's central bank foresees the economy growing around 6.8% in 2016, above what we are assuming will be the new growth target of 6.5%. The PBOC also expects exports to grow around 3% and imports to grow just over 2%. The trend rate for those two trade numbers is in the double digits, and such low forecasts imply a continuing drag on China's suppliers as well as weak global trade in general. The new growth and inflation targets will be announced to the legislature next spring, but expect both to be lower than the current targets of 7% and 3% respectively. Overall, most analysts and banks expect the economy to be weak but stable next year. Other expectations: Slowing growth but no hard landing, a much weaker yuan, and a few more interest rate cuts. Market consensus is for 6.5% GDP growth in 2016. Within the consensus, some analysts are more bearish than others. According to the Wall Street Journal, both Barclays and State Street expect 2016 growth of 6%, below target and well under Xi's growth floor, as a result of excess capacity in industry and housing, persistent deflation, and other issues. HSBC in November put its forecast at a brisk 7.2%. In general most analysts see growth around 6.5%, plus or minus about a half of a percent. We are entering 2016 with a far tighter range of growth forecasts than when we entered 2015. China will slow next year, and 2016 will be another year of speculation about just how much lower the slowdown can go. I would argue that for those outside of mainland China the real question should be not "how much will GDP growth slow?" but “how far will industry slow?" The divergence between services and industry will deepen next year. Rapid growth in services and consumption are both great for domestic stability and those who sell their wares within China’s boarders. But, another year of slower factory output means another year of sluggish commodity and machinery demand. A stable China growing at 6.5% next year means a positive contribution to global growth on a mathematical basis, but means more weakness passed along to economies linked to China’s once insatiable demand for machinery and commodities. A Soft Landing + Economic Rebalancing = Good news for consumption and service sectors, but not very good news for industry and the lion's share of import demand from the rest of the world. Underdeveloped consumption and service sectors have a lot of room ahead to catch up to regional peers. And, most reforms favor boosting those two sectors. Less investment is being put to work in industry and construction - both plagued with overcapacity issues. In addition, most reforms seem primed to slow industrial output. Stable growth is not necessarily a good thing for key commodity and industrial machinery import demand. For those who choose to measure China's economic activity by counting rail cars and electricity output, 2016 will look like a hard-landing year again. 2016 will see a constant flow of new reform and restructuring plans and policies announced. Liberalizing markets, trying to reduce financial risks, and possibly more potential changes to state-owned firms will be some of the policy themes. But, there are three very import reforms that seem to stand out as leadership priorities for 2016. Capital account liberalization will continue to roll along next year as Beijing prepares to free the yuan by 2020. We should see higher quotas for inbound securites investment as well as more volatility in the yuan as it slowly becomes more untethered. 2016 will see meaningful changes to China's household registration system. The household registration system is a throwback to central planning days. It excludes migrants workers - roughly 20% of the population - from social services like education and medical benefits if those migrants live outside of the locality where they were registered at birth. The Mao-era policy persists because urban registered city dwellers do not want their services diluted by folks from the countryside. If Beijing can make real headway, and allow 20% of the population access to key social services, it can unlock sizable income and savings for consumption. At a very recent meeting of China's leadership, fixing industrial overcapacity was a frequent topic for announcements. We have heard Beijing talk about fixing overcapacity issues in the past, only to ignore the problem at the first sign of economic slowdown. But, recent announcements indicate that reducing overcapacity and removing "zombie" firms through bankruptcies and mergers is a core reform for next year. So what does this mean for growth? The household registration reforms will be good for consumption and services. Overcapacity fixes will be a negative for industry. These two reforms should drive an even bigger wedge into China's two-speed economy. As mentioned in previous blog postings, the yuan is in a tug-of-war between market forces putting downward pressure on an overvalued yuan, and policymakers looking to keep the currency stable and strong for economic restructuring purposes and political reasons. In August, the PBOC introduced changes intended to increase market forces on yuan price setting. The PBOC still enjoys a great deal of control over the yuan via massive $3.5 trillion in exchange reserves and control over currency printing, but less control than it had before August. As a result, market pressure will weigh on yuan price moves more than in the past, and the yuan will experience greater volatility in 2016. Beijing has indicated it wants a "strong and stable" yuan. The introduction of the CFETS RMB Index recently - a basket of currencies by which the PBOC may measure the yuan's relative value - could indicate a shift away from viewing a "strong and stable" yuan as "strong and stable" measured against a wide basket of currencies and not just measured against US dollar. See the following blog posting for more details: 5 Important Things You Should Know About The Chinese Yuan. All in all, downward market pressure may have a greater influence on the yuan vs. the dollar than in the past. But, a Beijing engineered policy-driven devaluation to revive growth is unlikely for reform and political reasons, especially as the PBOC is already expecting very weak exports in 2016 (see PBOC forecasts above) and China's trade surplus is already quite massive. China has plenty of tools to fight weak growth, and a large engineered devaluation would draw the ire of central bankers around the world as China prepares to host the G20 in 2016. It would also reignite imbalances by transferring wealth from households back to industry. So, we should expect to see a modestly weaker yuan vs. the US dollar in 2016, and much more volatility, but likely no major devaluation policy. We should expect to see more stimulus measures in 2016, but fewer, smaller, and possibly different measures than in 2015. The economy is entering 2016 with good momentum, and a growth target lowering to 6.5% will reduce the stimulus requirements to meet that lower target. Beijing gave indications this week that more stimulative measures could be on the way in order to create "appropriate monetary conditions for structural reforms." China's monetary policy is still more restrictive than in easing cycles in the past (see the chart on the right). Easing will probably come in the form of targeted easing over broad easing now that we have seen broad reflation finally kick in and a bottom in the recent credit slowdown. The market expects the required reserve rate (RRR) - the broadest and most effective tool - to be cut by 2% more in 2016, after being cut 2.5% this year. Given the current growth momentum and worries about excesses and overcapacity, we will probably see fewer cuts than the broad consensus; perhaps only 1% or less. Beijing has indicated that fiscal stimulus will start to come more in the form of tax cuts, and less in the form of spending. Expect another fiscal deficit, but primarily driven by tax cuts. This will have the effect of lowering the fiscal boost impact on basic infrastructure, and therefore heavy industry investment - the traditional recipient of fiscal stimulus in past years - will probably continue to weaken. So, more fiscal stimulus does not necessarily mean more demand for key commodities and more demand for industrial machinery. A fiscal boost in 2016 could be felt more in services, green energy, or consumption, which would differentiate it from past fiscal stimulus measures. China's easing measures on Friday were accompanied by the removal of the mandated deposit rate ceiling, the final and riskiest piece of financial rate market liberalization. The required reserve ratio (RRR) was lowered 0.50% to 17.5%, potentially unleashing $80 billion USD of funds into the lending market. Benchmark rates were also cut, bringing the 1 year deposit benchmark to 1.50%, below the latest inflation reading of 1.60% in an effort to boost consumption. HSBC expects all easing measures last week to release roughly $110 billion of liquidity into credit markets. The potential boost to overall economic activity will come in 2016, as easing measures take months to spread. But, it is important to note that easing measures over the last year have done little to boost overall credit growth as policy measures to rein in shadow banking and clean up local government debt have amounted to credit tightening. Interest rate market liberalization moves accompanied the easing measures. According to the PBOC, evidence shows that financial liberalization in the midst of low inflation while lowering rates reduces the riskiness of financial reforms. ICBC, China's biggest lender, had a deposit rate below the mandated ceiling, in an indication that banks are not fully utilizing deposit rate flexibility yet. China began interest rate liberalization in 2013 by removing mandated lending rate ranges. With the removal of the mandated deposit rate based on the PBOC's benchmark rate, policymakers have effectively allowed for markets to set interest rates. However, not all control has been given up with the liberalization moves. The PBOC still has significant control over banks and has indicated that it will "discipline" banks that use unusually high interest rates and disrupt the market, and reward those with low deposit rates. Rates have been officially freed-up, but the PBOC will probably exercise influence in other ways. Liberalizing rates is a milestone for reforms intended to roll back decades of financial repression, whereby households subsidized rapid growth in industry and investment via cheap loans funded by artificially low bank deposit rates. The rate cuts last week followed a similar pattern to the currency devalue in August: Lower the rate, but allow markets more control. The moves were a trade-off between short-term stimulus and reform advancement. China's September trade data was full of mostly bad news, but not all was negative. Trade numbers pointed to weakening global demand, slower domestic manufacturing activity, but improving demand for many key commodities. Exports declined, but less than last month. 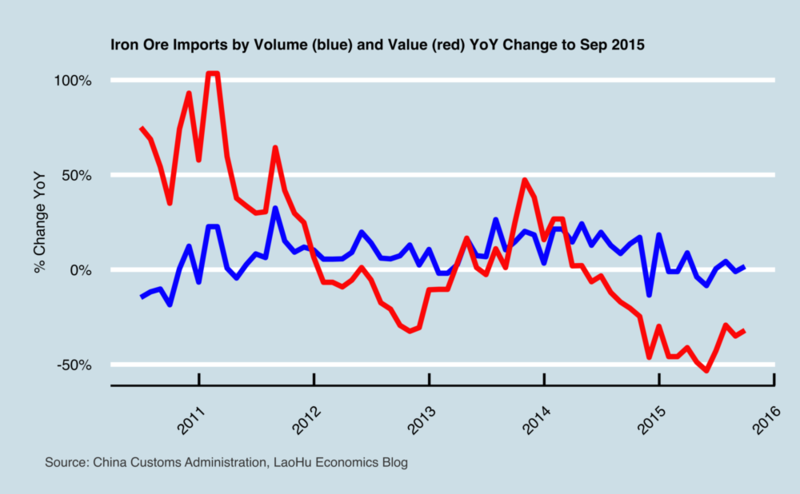 Imports on a value basis meaningfully dropped from September last year. A number of imports of manufactured goods and imports from manufacturing countries declined in the double digits; a break from months past. Weak commodity demand was not the biggest driver of these bad trade numbers. Headline imports exaggerated commodity demand weakness. In fact, many key commodities on a volume basis continue to increase. Much of the drop in imports can be attributed to the extremely sharp commodity price drops over the last year as suppliers continue to drive forward production. Volumes are increasing. Improved exports and a $60 billion trade surplus mean Beijing is less likely to let the CNY decline. A strong currency is important for restructuring the economy and reserve currency ambitions. There is nothing in these numbers that would convince China to devalue. The mini-devalue that shook global markets in August was most likely a one-off. China's currency has been relatively strong vs. most trading partners over the last year, decreasing trade competitiveness. Much of this has resulted in declining trade numbers. The CNY is up over 7.5% on the EUR this year, and up about 8% on the JPY. Imports for processing declined 37%, pointing to weaker global demand. Manufacturing imports have declined significantly, and trade with key partners in the global manufacturing supply chain has dropped by double digits. That would indicate weaker global demand. China's voracious appetite for raw materials from the rest of the world is in flux. The economy’s inevitable slowdown to a more sustainable rate of growth has been one of the most widely anticipated global economic events in recent times; the quandary has been just how slow and how extreme the drop will be. Gauging China’s demand for commodities will depend not only on figuring out how slow China's economy will eventually grow, but what sectors are slowing. There are three important things to note about China’s commodity demand. First, industry and construction, the main sources of raw material usage, have declined much faster than the overall economy. This trend will continue in 2016 as Beijing lowers its growth target again, keeping downward pressure on major commodity demand. Second, price declines have exaggerated China’s commodity import drop. Recently, most major commodities have seen weaker imports, but not the collapse suggested by headline numbers. 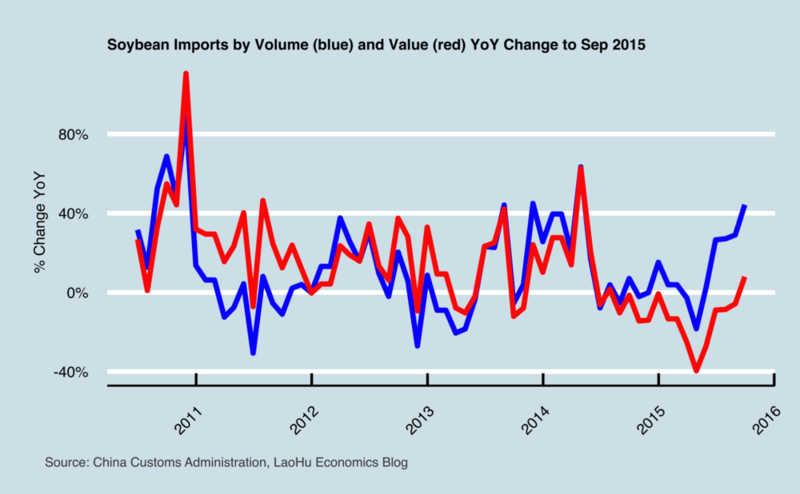 Import volumes have held up much better than in the last economic downturn (see the charts below). And third, demand for various commodities will be highly divergent going forward, with coal demand for example, dropping for the foreseeable future, and agricultural imports rising. China's slowdown is disproportionately hurting commodity demand, and supply growth globally has overwhelmed weaker demand. For years Beijing has told us two things: They are going to restructure to quality growth (services and consumption playing a bigger role), and policymakers want to move growth to a lower sustainable trend rate. The only way to achieve those two goals is by letting industry and fixed investment drop (which is what we have seen in recent years) while maintaining rapid growth in services and consumption. Heavy industry has dropped like a bag of hammers, and services and consumption have remained strong. That has made growth highly uneven on its way down to a lower more sustainable long-term rate. A commodity exporter gets little benefit from a soft landing in overall GDP in such a bifurcated growth scenario. Online retail sales are growing at almost 50% a year, while steel production is down almost 5% from last year. Compounding the uneven slowdown effects, much of the world's commodity capacity was built for China's "miracle growth" of the 2000s. Supply, especially from mainland China producers, will take some time to adjust to a weaker China. For many commodity exporters in markets where supply has charged forward unabated, China's uneven slowdown has felt like a hard landing. Expect weak demand for many commodities to continue into 2016 as Beijing will probably reduce the growth target another 0.50%. A reduced growth target will lead to reduced fiscal and monetary stimulus, which will disproportionately weigh on investment and heavy industry, the main sources of demand for raw materials. We may see a short-term boost in demand from the property market rebound this year and late '15 fiscal spending, but demand may slow further in 2016 for most major commodities. Demand has weakened for most commodities, but we are not witnessing a complete collapse of all commodity demand. 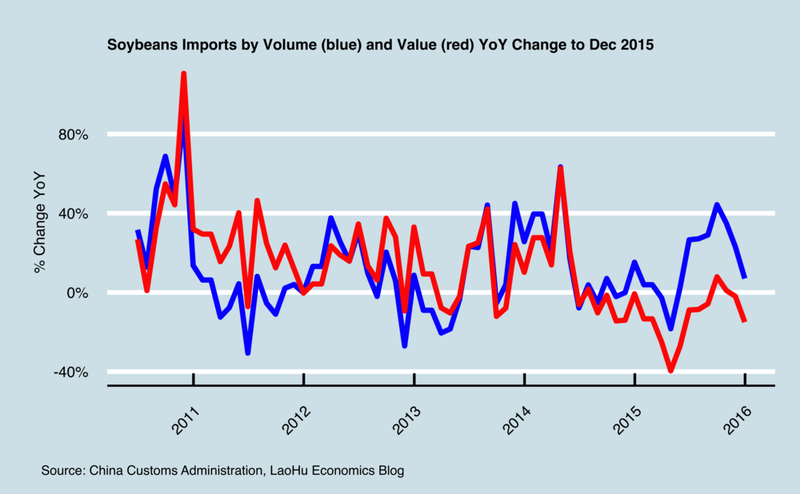 In fact, as seen from the charts below, the volume of imports is weak, but not falling dramatically. It is the combination of both weak demand and commodity producers increasing output that has lead to the massive price drops, and the dramatic drop in the value of China's imports. Iron ore, copper, oil, and aluminum suppliers in particular have pushed greater output despite weaker demand in recent years. The result has been a tidal wave of supply overwhelming demand and crushing prices. China's suppliers in particular have kept production robust in the face of weaker demand. Domestic suppliers are still pushing down prices. China mining firms are not subject to the same profit maximizer behavior as more market-oriented firms globally. Local mines will keep pumping out production regardless of the price as local leaders are incentivized to keep mines and smelters open in order to maintain stable employment. China produces 47% of the world's aluminum and over 40% of its iron ore, and miners seem to be keeping the foot on the production “gas pedal" regardless of prices. Therefore, excess supply in local commodities - aluminum and iron ore in particular - may persist for some time, even as prices drop. China only produces 9% of global copper output, meaning supply is primarily based outside of China and will come offline much quicker than other base metals as prices fall. China accounts for 13% of global economic growth, but 47% of the world’s coal consumption. almost 70% of China’s electricity production comes from coal burning, causing the deadliest pollution in the world. A recent study by Berkeley Earth concluded that 1.6 million deaths in China each year can be attributed to air pollution. Coal has powered China’s economic "miracle growth", and now is the source of much pain. After the 2013 “airpocalypse” events in China, pollution became the main source of civil unrest. Beijing countered by announcing the “war on pollution”. Since then, coal demand has plummeted. Coal mining investment to August 2015 is down 14% from last year. Beijing is trying to rapidly reduce coal burning as it adds massive amounts of renewable energy capacity. The bottom line is, coal demand will face the double whammy of slowing industry and the “war on pollution”. Coal demand of all types will continue a rapid decline for the foreseeable future; bad news for Mongolian and Australian exporters. Copper demand has remained very weak, which for many analysts seems to be a surprise given the potential state-directed boost expected this year. China is working to upgrade its cross-country electricity transmission in order to send electricity instead of coal from resource rich regions to wealthy coastal cities beset with deadly air pollution. Grid upgrades, renewable energy investments, and vast long distance ultra-high voltage power line investment was supposed to boost copper demand this year. Grid investment alone was supposed to increase 24% in 2015, as announced early in the year. As recent as September 1, officials announced new spending of $315 billion from 2015 to 2020 for grid infrastructure improvements. However, improved demand for copper has yet to materialize. Recent estimates for 2015 demand by Antiake are for a 6% consumption growth in 2015, down from a 9% increase forecasted at the beginning of the year. China copper imports by volume are down 8% so far this year vs. 2014. Most research firms have grown more negative on copper over the last few months as uncertainty over Beijing’s ability to keep the economy on track grows. Goldman Sachs sees copper demand continuing to decline on property weakness, arguing that potential improvements in grid-related demand are overstated. Societe Generale recently cut its forecast for 2015 global copper demand nearly in half, to 2.5%, primarily driven by uncertainty in China. Supply on the other hand is expected to increase 3% for the year. Demand improvement depends on whether or not you think China’s infrastructure and grid spending surge will ever materialize. I expect it will, and imports will have to increase as inventories have dwindled. There are two offsetting factors in China’s oil demand prospects. First, demand from the real economy has weakened. Car sales have slowed to around 2.5% so far this year from a 10 year average annual growth rate of 21%. Freight traffic will moderate with the industry slowdown. Pollution controls will force changes to automobile efficiency. Crude oil imports on a volume basis have grown 10.5% on average for the last ten years. But going forward, the demand from the real economy will certainly be weaker than the last ten years. As of August, the IEA’s latest forecast for Chinese demand growth is 3.2% for 2015. China imports almost two-thirds of its oil consumed, and production is up only 3% this year. So, import growth from underlying demand will be weaker than in the past, running at a third of the trend growth rate potentially. On the other hand, China is building massive strategic petroleum reserves, and is not finished yet. According to the International Energy Agency China has accumulated about 200 million barrels of crude in its reserve so far and aims to have 500 million by 2020. 300 million barrels represents about 13% of China’s total 2014 crude imports. When and if all this storage is added is in the hands of policymakers. The end result of these two opposing factors is a robust 10% growth in imports for the year so far. But going forward, the problem with oil demand is similar to other commodities; structural underlying demand growth is certainly growing weaker relative to previous years, but the prospects for a boost in demand are in the hands of policymakers building reserves, and therefore remains an uncertainty. Argicultural commodity demand in China is widely expected to fare much better than metals and energy. Rising incomes, changing preferences, a structural rebalance to consumption, and recent price declines have pushed commodity imports higher this year. By volume, some commodity shipments have surged dramatically (see chart below). The USDA expects continued growth for years to come, with soybeans dominating imports. The US supplies half of China’s soybean and cotton imports, so the trend is a positive for US exporters. With the expectation of another target growth reduction next year, infrastructure growth is likely to continue its deceleration. Iron ore demand will suffer from lower infrastructure investment than most other commodities. About a third of iron ore goes to infrastructure building, with another third to property, and the last third to “other”. Beijing’s infrastructure investment in the pipeline this year will probably add to demand a bit, but with the lower growth target comes less infrastructure spending. So, on the demand side, the property market rebound will improve demand, but a lower growth target in 2016 will potentially negate the property market rebound. Demand will weaken further, but not collapse. On the supply side, many expect China ore producers to drop out when prices fall below $45/t, but iron ore production is a political issue. Local policy bias to keep folks employed often outweighs profitability. Supporting mines could get quite costly eventually. China’s mines are high cost, with estimated break-even prices as high as $80. That compares to BHP at $28/t, Rio around $30/t, Vale at $39, and Fortescue roughly $42/t. If China were to support all of its iron ore producers down to $50/t, it would cost the government potentially 0.40% of GDP at a time when more pressing fiscal needs are abundant. Credit Suisse expects iron ore prices to stay flat for the rest of the year, declining to $50/t in early 2016. China's GDP data reliability has been in question for years. Over the last couple of decades questions regularly arise on whether or not to believe official growth numbers out of Beijing. Recently the subject has gained traction in the news as stock market volatility elevated worries of China's economic prospects. Even in the official data there is evidence that underlying growth is below the stated 7% numbers for Q1 & Q2. As I have mentioned in a previous blog, the froth from a financial market surge pushed China's growth numbers to 7% so far this year. Underling growth readings from the official data point to a GDP growth more likely around 6.5% so far this year. See my posting 7% GDP growth? Probably not. for more details. Certainly if you look at other EM country GDP numbers over time, China's data looks suspiciously smooth. 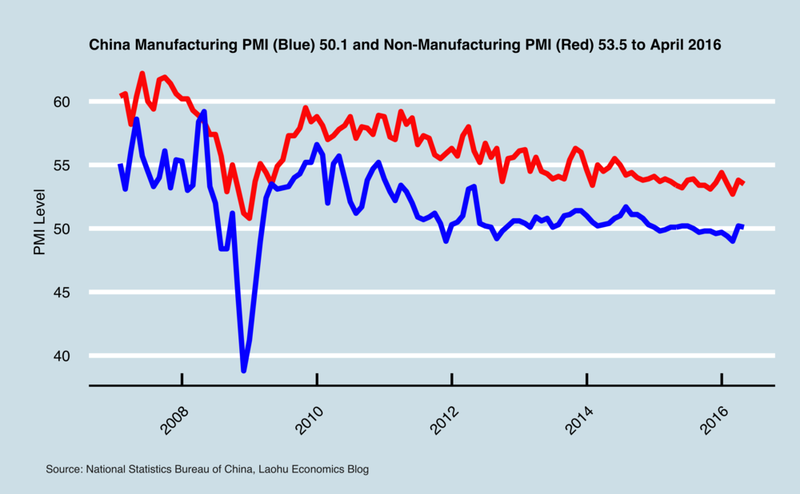 But while Beijing can be accused of smoothing the data, or suffering the same difficulties that other EM countries have measuring the entire economy during a rapid transition, recent charges that China's numbers are completely fabricated to hide a hard landing are less credible. Smoothing, calculation problems, distortions from some local leaders fluffing the data, and the occasional transient froth from specific sectors means the GDP number are far from total reliability, but they can still be in the right ballpark. Few studies have been done on the reliability of China's GDP data. The most important that I know of was conducted by the Fed Reserve Bank of SF in an economic letter from March 25th 2013. After using alternative data from inside and outside of China they concluded that the GDP numbers were not unreliable stating that "These alternative domestic and foreign sources provide no evidence that China’s economic growth was slower than official data indicate. ", and that "...these models suggest that Chinese growth has been in the ballpark of what official data have reported." The conclusion ruled out policymaker complete fabrication. But in the end, the reality is that China's overall GDP number is of little use to most folks anyway, and a more nuanced analysis than in the past is required to know what is going on in individual sectors and the economy as a whole. Much was made of future Premier Li Keqiang's WikiLeaks memo stating his distrust of official GDP numbers back in 2007 when he was running the Liaoning province. He instead favored using rail freight data, electricity output, and bank loans to gauge the economy. Certainly in his province of Liaoning, a significant supplier of ore and heavy industry, a decade ago those three numbers were good indicators. But in today's China where services account for over 49% of economic output and industry around 42%, those three numbers are completely unrepresentative of the broad economy (see my posting The "Li Keqiang" Index: Why is that still a thing?). The 2010 leaked Li Keqiang memo spawned some of the first alternative GDP calculations. A version of the "Li Keqiang" index is on the chart to the right. There have been a wide variety of alternative GDP measures released over recent years. Some have very explicit ingredients, like the "Li Keqiang" index, which uses freight, electricity output, and bank loan data. But most alternative measures from research firms are black boxes, which is a concern. China's economic data is rooted in its communist planning past, with its main statistics bureau highly reliant on reporting numbers for heavy industries and the physical output of tangible things. As a result, most of China's economic data has to do with industry, with very little data available for crunching service sector statistics. My worry is that most alternative measures use the easy-to-get industrial data, therefore missing roughly half of economic output or more in the calculations. Official data is 7%, around 6.5% if you strip out the froth from the financial sector early in the year. Bloomberg news service has its own alternative measure for growth, and its GDP tracker is running 6.6% as of July 2015. Capital Economics has the number running somewhere around 5%. Lombard Street Research pegged growth at 3.8% in Q2, indicating a hard landing. There are a number of alternative GDP measures out there to choose from, which means nowadays both soft landing and hard landing forecasters seem to have evidence on their side. For my own monthly GDP measure, I calculate the numbers for industry and service GDP sectors independently using a wide variety of economic data and principal components analysis. Then, I combine the measures based on respective weightings in overall GDP. My indicators point to July growth running at 6.5% overall, with 5.6% from the industrial sector, and 7.8% from services. One implication of the rise of skepticism in China's numbers is that hard landing doomsayers and collapsists can now say that they have been proven right. Pundits, like Gordon Chang who has been warning for 15 years that a China collapse is imminent, are using data skepticism to bail out their own bad predictions. With GDP skepticism on their side, hard landing doomsayers and collapsists have now begun to dominate much of the China conversation. There are plenty of indications that do not support the dramatic hard landing GDP numbers indicated by the more pessimistic alternative measures like Lombard's. Number crunching some data from outside of China, such as trade data from Australia and Brazil, does not confirm the dramatic declines by the more pessimistic alternative GDP measures (see my chart on the right, a generic unscaled combination of various data). In fact, on a volume basis, shipments from key exporting countries do not confirm a hard lading scenario. Ausrtalian iron ore shipments on a volume basis, Japan and Korea exports to China, and Brazilian shipments, all point to weaker demand for sure, but not a dramatic collapse of growth. The private Caixin manufacturing PMI is running at 47.3, indicating contraction in manufacturing, but far from the PMI numbers in the 30s in 2008 that would indicate China is in economic crisis territory. In the past, the general rule was 8% growth was the threshold for supporting employment, and anything below that would lead to unrest and massive unemployment. If China is growing well below half of the threshold widely accepted only 4-5 years ago we would expect to see problems from massive joblessness. Pollution is still the number one cause of social unrest, and massive unemployment has not been seen. Growth is certainly slowing, probably more than official numbers indicate. But, many other information sources do not confirm the hard landing indicated by some alternative GDP measure providers. The overall GDP number might give us an indication of whether Beijing needs more or less stimulus, and frequently has an effect on risk assets around the world. But, because of restructuring and a highly uneven slowdown, China's 7% growth number is less relevant than it once was. For years Beijing has told us two things: They are going to restructure to quality growth (services and consumption playing a bigger role), and policymakers want to move growth to a lower sustainable trend rate. The only way to achieve those two goals is by letting industry and fixed investment drop, which is what we have seen, while maintaining rapid growth in services and consumption. Heavy industry has dropped like a bag of hammers, and services and consumption have remained strong, making economic growth highly uneven. A commodity exporter gets little use from the overall GDP in such a bifurcated growth scenario, as does an online retailer for example. Online retail sales are growing at almost 50%, all the while steel production is down almost 5% from last year. In short, Beijing is probably guilty of smoothing data, and/or releasing flawed data as it struggles with the difficulties of measuring a rapidly changing vast economy. There is a small possibility that data is fabricated, as China's leadership will go to great lengths to maintain control over their perceived governing ability. But, a nefarious attempt to completely misrepresent economic growth in order to mask a hard landing is less probable as other information sources do not confirm that finding. If we accept the San Francisco Fed's 2013 analysis, even if we assume China's GDP numbers are flawed and not completely reliable, they are at least in the right ballpark. But, GDP is not a useful number for China research anyway. A more nuanced and complex analysis is required to measure what is happening in the Chinese economy going forward. China trade data saw another negative month in August. Both imports and exports declined from the same time last year. Certainly weak demand from both China and the rest of the world contributed to the declines, but China's strong currency and commodity supply growth leading to price declines were also significant contributors. Imports declined from August of last month by roughly 14%. But, much of this decline can be attributed to commodity price drops over the last year as producers - particularly crude oil and iron ore - have not let up on supply growth. The S&P World Commodity Index has dropped around 50% over the last year, leading to a dramatic decline in the value of China's commodity imports, the largest import category. Many key commodities have seen an increase in the volume of shipments to China (see the chart on the right). This can be confirmed by the latest Australian trade numbers, showing the volume of iron ore and coal shipped to China has increased over the summer. As of June, Australia iron ore shipments to China were up 12% by volume. 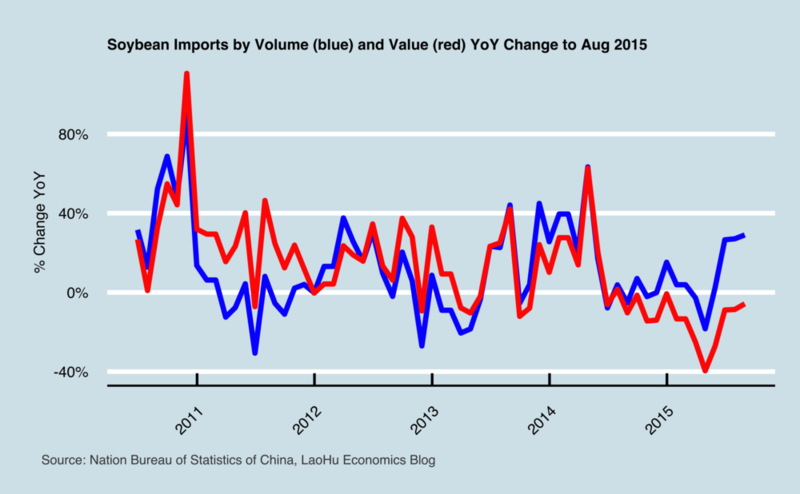 Accounting for dramatic commodity price moves, China import volumes were roughly flat on the year. Export numbers declined just over 5% from last year. Exports have been weak all year, and will continue to be weak as the Chinese yuan has appreciated meaningfully vs. all other trading partners, with the exception of the US (see chart on the right). China's strong currency vs. major trading partners will continue to be a drag on the export numbers for some time. China exports were strong in a few countries on the Asian supply chain. Imports have seen declines from both commodity and machinery exporting countries. This trend will continue as Beijing lowers the target growth rate in 2016 (see my posting 3 reasons why China could lower the 2016 growth target to 6.5% and what it means going forward), commodity producers continue to increase output, and the CNY remains strong vs. trade partners on a 1 year basis. The PBOC had a busy Tuesday, adjusting the currency and announcing modestly improved lending numbers. China's yuan fixing was dropped 1.9% overnight by the PBOC, throwing a bone to exporters under siege by competitors with devalued currency advantages this year (see my posting China Trade Numbers Decline As Beijing Maintains Strong CNY, And Commodity Prices Decline.). All in all, a 2% devalue is pretty modest in comparison to the double digit rise in the CNY against most major currencies. It is important to note that the devalue was part of an overall methodology change intended to make the mechanism for setting the fixing rate more market friendly. The changes and devalue for that reason were very shrewd: The lower currency helps exporters and stimulates growth, and the market mechanism changes keep the IMF from getting spooked. The IMF has explicitly welcomed the market-oriented changes Beijing has made Tuesday to the mechanisms used to set the fixing. Beijing sees getting into the SDR as an important step towards becoming a major reserve currency. Expect more market interventions in the future as the new market-oriented mechanisms force the PBOC to relinquish some control and subsequently intervene to stabilize the FX. China's strong currency has been a meaningful headwind to exporters, as seen in the sizable trade number declines in July. Most trading partner currencies have tanked vs. the yuan, leaving China's export sector at a significant disadvantage and driving down inflation. The CNY this year had appreciated 17% on the Euro, 18% vs. the Japanese yen, and 11% vs. the Korean won up to Monday this week before the lower fixing. Beijing's plans to keep the CNY stable against the US dollar has subjected the yuan to dollar strength at the expense of the export sector. Importing inflation is not a problem, as CPI is running at half of the target this year. Given money supply is well above the target of 12%, loan growth is up, and fiscal stimulus is already in the pipeline, a currency adjustment is a stimulative policy option not yet employed this year. China credit was subject to stock market activity and the continued reduction of shadow banking. China's July lending and credit numbers rose in July, with total outstanding loans up well above 15% and money supply surging above the 12% target at 13.3% from July of last year. The data and PBOC comments point to two factors at play: The dramatic stock market activity, and the continued reduction of shadow banking activity. First, China's credit numbers were heavily influenced by activity in the stock markets and PBOC interventions in July. Outstanding bank loan growth accelerated, but total financing slowed measurably as margin reduction activity reduced overall debt and credit growth. Overall credit numbers are no boon to short-term activity. The PBOC in a statement said "In order to stabilise market expectations, guard against financial risks, and support healthy capital market development, monetary policy and the banking system in July took a series of temporary measures. Such measures also influence the growth of money supply and loans." 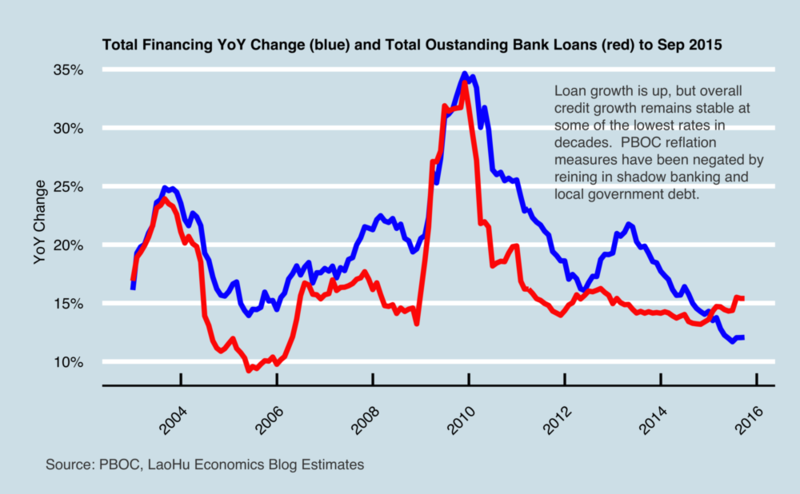 Second, China's non-traditional credit continues to decelerate. Trust loan growth is still fading. Entrusted loans continue to weaken. Beijing's efforts to reduce the opaque local debt and shadow banking activities are moving forward. All in all, the weaker currency should help exports and manufacturing, but given the minimal amount of devaluation, only modestly. The lending numbers were distorted this month by stock market activities, but the weak overall credit growth will not be helpful to boost short-term growth. China's headline trade numbers declined significantly in July. Exports dropped 8.3% from last year, with imports down 8.1%. The numbers hint at continued weak demand, but within the details there are two main factors contributing to the declines. First, China's exporters are paying the price for Beijing's efforts to make the CNY a reserve currency. China has held the CNY steady vs. the USD for the purpose of convincing the IMF to include the yuan in its Special Drawing Rights when it votes this Fall. SDR inclusion is seen by Beijing as an important step for pushing the yuan into major reserve currency status. The CNY has in turn inherited the US dollar strength, giving a significant competitive trade advantage to China's major trading partners (see the chart on the right) at the expense of Chinese exports. Because of the CNY strength, expect exports to show further weakness for months to come. This will act as a headwind to manufacturers; an opposing force to Beijing's fiscal and monetary stimulus. Second, the dramatic drop in commodity prices has contributed the bulk of the declining headline import number. Some of China's largest commodity imports have seen dramatic price drops this year. Iron ore prices are down 42% from last year. Oil prices are down over 50%. After adjusting for commodity prices, imports show weak demand, but a more mixed picture. By volume, the overall demand picture for many commodities in July was positive. The import weakness has come more from manufactured goods than commodity demand. A very simple commodity price adjustment shows imports by volume increased around 7.4% on the year (see chart on the right). As with exports, import numbers will be weak for some time as commodity price declines lower the overall volume numbers, and currency competitiveness helps trade partners. Crude oil imports were up 29% from last year as strategic reserves are filled, and stockpiling on price declines takes place. Other commodities also fared well, based on import volume: Iron ore up 4% from last year, palm oil up 36%, copper ore up 7%, soybeans up 27%, and unwrought copper finally showing a gain up 1% after declining all year. Automobile imports saw the biggest drop in import demand, down 27% from last year, replacing coal as China's weakest import. Consumer goods and electronic exports saw the largest declines among export categories. Exports for processing and re-export were down 9.5%, indicating weaker supply chain activity. Imports from South Africa, New Zealand, Germany, and Japan saw the largest declines, as currency appreciation and weaker commodity prices weighed on imports. China announced a target budget deficit of 2.3% of GDP early in 2015, a fiscal expansion compared to the 1.8% budget deficit last year. The fiscal expansion has yet to materialize. As of June this year, fiscal revenues have exceeded expenditures by more than 200 billion RMB. And, at the halfway point of the year China has to spend more than double the money to reach the 2015 fiscal expenditure total. Those numbers mean that China's much-anticipated fiscal stimulus is either on its way in the second half of 2015, or Beijing has decided to be more frugal than advertised this year. Just how much potential fiscal stimulus? To meet the budget deficit target of 2.3%, China needs to spend 1.8 trillion RMB in excess of revenues in the second half of this year. Beijing also needs to deploy over 9 trillion RMB in the second half to reach its total expenditure targets. These sums are meaningful, and if deployed would finally add the fiscal boost we have been waiting to see all year. Overnight, two of China's main policy banks announced that they will issue 1.5 trillion RMB in bonds to fund infrastructure spending. The spending will flow to the usual sectors: shantytown renewal, railways, urban transportation. If the spending materializes this year, it will be additive to industry and construction growth. Added to a housing market cyclical recovery (see my posting China's Property Market Continues To Improve. for details), the numbers should help boost growth prospects in the short-term. It is important to note that last year's budget deficit fell short of targets, resulting in a lower fiscal boost than many expected. If Beijing deploys capital in the amount planned, the second half of this year will look better. Whether a boost can be sustained is up for debate. China's PMI data showed a continuation of the trend we have seen all year: Factory output is sluggish, service growth is strong. On balance, the PMI numbers point to an economy that is stable but still weak. Economic indictors in June showed that while we are seeing broad improvements, some large domestic industries such as steel, cement, mining, and automobile production remain weak. The PMIs hint at continued weakness into July. External demand has also been challenged by the dramatic appreciation of the yuan versus key trading partners. Services and consumption continue to outpace factory output. The official manufacturing PMI registered at 50, right on top of the threshold between contraction and expansion. The components also pointed to continuing weakness. The service PMI continues to improve, rising to 53.9, one of the highest readings of the year. Historically, the PMI number falls from June to July. The average decline for the last ten years has been -0.70. Both service and manufacturing PMIs reported weaker new orders. New orders for the manufacturing PMI fell below the 50 mark to 49.9. The service PMI new orders number also declined, running modestly above the contraction threshold at 50.1. Large enterprises fared much better than small firms, with PMIs coming in at 50.6 and 46.9 respectively. Beijing's primary goal of maintaining stable employment remains at risk. The employment PMI number, which has been under 50 every month since May 2012, remains weak at 48. The number was as low as 47.8 early in the year. China's stock market volatility has ramped up again. The Shanghai Composite fell 8.5% on Monday. Worries of a market panic have resumed. As I have mentioned in previous blog posts, applying rational valuations to China's share prices is a futile endeavor in the current environment. The market has been disconnected from the real economy for some time. Valuations swing wildly. Firms can halt trading in their own shares if they don't like the direction of price moves. Beijing has stepped in, but in doing so has potentially caused more uncertainty. See my blog postings from the last few months for more details: China's stock market volatility is crazy, and who knows where we go from here., and China's stock market surge by the numbers., and China stock market returns and the real economy. Just how disconnected? The market at this point is a tug of war between Beijing policymakers trying to stabilize markets, and behavior-prone investors driving the market to unreasonable levels of volatility. China's leadership has a bad track record of controlling markets. The debt markets, the property markets, and natural resource pricing (water in particular) have proved difficult to control. Beijing's attempts to control markets have often contributed to inefficiencies and moral hazards. The PBOC and Beijing policymakers, having already entered the business of bailing out shareholders with early July interventions, are now stuck potentially piling resources into the stock market stabilization (see my blog post China stock market interventions are a setback to reforms. for more details). The battle between China's policymakers and behavior-driven investors will probably end poorly. On a good note, margin debt has fallen nearly $100 billion since the peak. June economic data appeared to be unscathed from the market drop. Valuations do not seem unreasonable currently. But, volatility does not seem to be going away. Here is a graphical timeline of stock market events over the last year. There are encouraging signs that overall growth has improved very recently. Retail sales, manufacturing, trade (see my post Quick Data Update: Trade Data Improves In June. The Improvement Is Much Better Than The Headline Numbers Imply. ), and investment all saw modest improvements in June. The property market improvement has accelerated. Housing prices in the top-tier cities are on fire, and sales are growing in the double digits. Prospects look good for the second half of 2015, but we are coming from a much lower growth rate than the first half headline GDP growth number implies. It is not all good news however. Growth in the first half was worse than the headlines suggest owing to a big distortion that may not carry over into the rest of 2015. And, growth in the industrial sector portion of GDP dipped below 6% already this year (the secondary sector of GDP grew at 5.8% in Q2). For those worried about commodities and China's making and selling of tangible stuff (and not services), growth is effectively 5.8%, well below the 7% figure overall. Imports of many key commodities have fallen in the double digits as policy reflation has yet to produce the expected growth boost. So, expect improvements for the second half of the year, especially in construction and property linked sectors. However, the poor showing in H1 will increase the risk of Beijing failing to hit the 7% target by the end of the year. Growth overall seems to have improved in June. A number of indicators improved modestly in June. The rebounding numbers were not massive, but the upticks were broad. The data suggests at least a stabilization if not the front end of a cyclical rebound. Industrial production, retail sales, fixed investment, services & manufacturing PMI, both imports & exports, and housing data all saw an improvement in June. April/May looks to be the low point of growth this year so far. If we see fiscal measures deployed in the second half of the year, PBOC reflation measures spreading into the broad economy, and the property market acceleration all take place, then the rebound will most likely gain momentum. If the policy reflation effort fizzles, then the rebound may be muted. While certain parts of the economy, property in particular, are showing tangible signs of meaningful improvement, the effects of PBOC easing and a planned government fiscal expansion are much more muted. Total outstanding credit is still slowing (See chart), and fiscal stimulus has yet to be fully deployed. Expectations of policy reflation are still mostly based on anticipation and not tangible evidence that reflation is taking place. As far as the expected fiscal boost goes, fiscal spending usually accelerates in the second half of the year. Although a budget deficit was targeted this year, China has netted a surplus in the first six months of the year. If the budget deficit target holds up this year, the second half of the year should see more than 2 trillion RMB in spending unfold. If spending plans play out for the rest of the year (I think they will), the stimulus will be a much-needed boost to the industrial and the construction sectors. But, again, reflation expectations for the rest of the year are mostly driven by the anticipation of policy measures boosting growth. That is a risk to growth prospects. There is little evidence of stimulus deployment in the numbers so far. Beijing is still running a fiscal surplus, total outstanding credit is still slowing, and without the extra boost from a transient surge in financial services GDP growth would be well below 7% so far this year. For more on the risks to policy reflation see my post Reflation Troubles. The housing market is on the mend. China's housing market continues to improve. Prices are rebounding, especially in the larger coastal economies. Inventory continues to be drawn-down; housing sales are up 18%, and finished construction is down 17%. There are a number of catalysts for the rebound: price declines, inventory drawdowns, policy easing, favorable mortgage rule changes, and homeowner upgrades. Given China's demographic changes and existing inventory excesses in the hinterlands, the long-term prospects are murky. But, for now we are at the front-end of a cyclical housing rebound. That is good for the industrial and construction sectors. For more details see my post China's Property Market Continues To Improve. GDP growth is lower than 7% if we remove a temporary distortion. For the first half of the year, the GDP number was distorted on the upside. The distortion was not due to manipulation by Beijing, but was instead a product of an unsustainable boom in the financial sector, at the very least encouraged by Beijing. The financial intermediation portion of the H1 GDP number grew 17.4%, driven by the surging stock markets and record IPOs. Without the additional one-off boost, growth would have certainly been below 7%, perhaps 6.5% for the year so far. So, unless financial services can surge another 17%, which is highly unlikely, the second half of the year will need to see a meaningful boost from reflation and the rebounding housing market to make up for it. See my posting 7% GDP growth? Probably not. for more details. The secondary sector of GDP growth (industry and construction) is falling like a bag of hammers. Services continue to fly. China's growth in Q2 was dominated by a fast-growing service sector, while the secondary sector (the building, making of tangible things) continues to decelerate. Even after removing the unsustainable surge in the financial sector, the service sector grew over 8% in Q2, while the secondary sector struggled to a disappointing 5.8%. The vast overwhelming majority of China's imports are meant for industry. So for those concerned with China's making and building of things, or China's commodity demand, Q2 effectively grew at 5.8%. We see the results of sluggish H1 industry and construction in China's weak commodity demand this year (See the chart below). One of the primary drags on China's economic growth this year has been the declining housing market. The market continues to show signs of a rebound that will eventually add a boost to growth in the short-term. The housing price drop over the last year has come as disposable income averaged an 8.5% increase (rising incomes with lower house prices). Effective price drops over the last year have been in the double digits, enticing buyers back into the market. PBOC measures have brought down borrowing rates. Mortgage restrictions, among other housing market restrictions, were lowered in March as Beijing tried to stimulate the market. Developers have been able to tap into homeowners' desire to upgrade. Prices are improving (see charts). Residential property sales are up 16% from last year. Completed residential construction declined 17% so far this year vs. last. New housing starts this year are down 16%. I calculate that this amounts to about 1.5 million fewer housing units on tap to be finished this year compared with last year; 7.5 million units of total supply this year at current trends. Although it is difficult to estimate housing demand, Goldman Sachs estimates equilibrium housing demand - given new household formation, urbanization, and obsolescence - is between 7.5 to 8 million units a year. At the current pace, demand is probably outstripping supply this year, and a pickup in sales and prices should boost new construction. The drivers of this housing rebound seem to be buyers intent on living in an upgraded house, not investors. An FT survey from May shows that potential homebuyers are expressing interest for self-occupancy home purchases, but have turned negative on purchasing for investment purposes. 45% of developers surveyed said that upgrades were the largest source of home sales in recent months. Investors seem less inclined to enter the market this year. In May, 14% of those in the FT survey said they intend to invest in property in the next three months. A property rebound driven by housing occupants and not investors may be more durable. Housing market improvement are taking place primarily in the first and second-tier cities, where housing rebounds will have a greater effect on the overall economy (see the map below). Real estate investment is growing at a weak 3.4% on the year. New housing starts are still declining, down 16% on the year. China has a sizable oversupply of unused homes; some estimates put vacancy rates at 22%. But, it is important to point out many of these empty units are investment properties not intended for occupancy. Structural and demographic changes may be changing long-term housing market prospects, and easing efforts to support the property market might renew bubble worries. But in the short-term, the housing market seems to be on the front end of a rebound. Real estate makes up ( directly and indirectly) about a quarter of China's economic growth. A real estate rebound is a significant development.